Below is a list of most of my publications and recent talks, usually the pdf of the paper and/or the slides are available for download. Here is a link to my Google Scholar page. All the documents provided in this page are made available by the authors for timely diffusion on a non-commercial basis. Copyrights are kept by the authors and/or copyright owners. Everyone copying these informations must agree with these terms. These files cannot be made available elsewhere without the permission of copyright owners. T.L. Mai, N. Navet, J. Migge, "A Hybrid Machine Learning and Schedulability Method for the Verification of TSN Networks", to appear at the 15th IEEE International Workshop on Factory Communication System (WFCS 2019), Sundsvall, Sweden, May 27-29, 2019. Determining a confidence level for ML prediction to possibly switch back to conventional mathematical analyses of various accuracy. Preliminary version available as technical report - pdf of the report. N. Navet, T.L. Mai, J. Migge, "Using Machine Learning to Speed Up the Design Space Exploration of Ethernet TSN networks ", Technical Report, University of Luxembourg, 2019. Machine learning for determining the feasibility of TSN configurations. Pdf of the report. I. Cibrario Bertolotti, G. Bloom, G. Cena, T. Hu, N. Navet, A. Valenzano, "Event Notification in CAN-based Sensor Networks", to appear in IEEE Transactions on Industrial Informatics, 2019. doi: 10.1109/TII.2019.2904082. N. Navet, J. Migge, "Insights into the performance and configuration of TCP in Automotive Ethernet Networks", 2018 IEEE Standards Association (IEEE-SA) Ethernet & IP @ Automotive Technology Day, London, October 8-9, 2018. Pdf of the slides. N. Navet, "A journey into time-triggered communication protocols with a focus on Ethernet TSN", Digicosme: Working Group on Real-Time Systems, Paris, June 2018. An historical perspective on time-triggered (TT) protocols and a few possible misconceptions about TT communication. Pdf of the slides. N. Navet, J. Migge, J. Villanueva, M. Boyer, "Pre-shaping bursty transmissions under IEEE802.1Q as a simple and efficient QoS mechanism", Proc. WCX18: SAE World Congress Experience, Detroit, Mi, April 2018. A shaping strategy for Ethernet TSN not requiring dedicated HW unlike CBS and TAS. Pdf of the slides. Extended version published in SAE International Journal of Passenger Cars—Electronic and Electrical Systems, 11(3):2018, https://doi.org/10.4271/2018-01-0756. Authors' preprint available here. S. M. Sundharam, N. Navet, S. Altmeyer, L. Havet, "A Model-Driven Co-design Framework for Fusing Control and Scheduling Viewpoints"
, special issue “Design and Implementation of Future CPS”, Sensors, 18(2), MDPI, 2018. A design framework to address the gaps between control and real-time software engineering. G. Brau, N. Navet and J. Hugues, "Towards the Systematic Analysis of Non-Functional Properties in Model-Based Engineering for Real-Time Embedded Systems", Science of Computer Programming, Elsevier, Volume 156, pages 1-20, 1 May 2018. A framework to systematize and automate the analysis of non-functional properties in Model-Based Systems Engineering. L. Fejoz, B. Régnier, P. Miramont, N. Navet, “Simulation-Based Fault Injection as a Verification Oracle for the Engineering of Time-Triggered Ethernet networks”, Proc. Embedded Real-Time Software and Systems (ERTS 2018), Toulouse, France, January 31-February 2, 2018. Best Paper Award. Experimental assessment of TTE clock synchronization precision. Pdf of the slides. J. Migge, J. Villanueva, N. Navet, M. Boyer, “Insights on the performance and configuration of AVB and TSN in automotive networks”, Proc. Embedded Real-Time Software and Systems (ERTS 2018), Toulouse, France, January 31-February 2, 2018. Applying TSN protocols on a demanding automotive case-study. N. Navet, J. Villanueva, J. Migge, M. Boyer, "Experimental assessment of QoS protocols for in-car Ethernet networks", 2017 IEEE Standards Association (IEEE-SA) Ethernet & IP @ Automotive Technology Day, San-Jose, Ca, October 31-November 2, 2017. Pdf of the slides. G. Brau, N. Navet and J. Hugues, "Heterogeneous models and analyses in the design of real-time embedded systems - an avionic case study", 25th International Conference on Real-Time Networks and Systems (RTNS’2017), Grenoble, France, October 4-6, 2017. Combining heterogeneous models and analyses in the design of an avionic system. T. Hu, I. Cibrario Bertolotti, N. Navet, "Towards Seamless Integration of N-Version Programming in Model-Based Design", 22nd IEEE International Conference on Emerging Technologies And Factory Automation (ETFA’2017), Limassol, Cyprus, September 12-15, 2017. Sofware patterns for implementing NVP. Pdf of the slides. N. Navet, T. Hu, I. Cibrario Bertolotti, "Software Patterns for Fault-Injection in CPS Engineering", WiP paper at the 22nd IEEE International Conference on Emerging Technologies And Factory Automation (ETFA’2017), Limassol, Cyprus, September 12-15, 2017. A step towards automated software fault-injection in DSLs for CPS. Pdf of the slides, pdf of the poster. I. Cibrario Bertolotti, T. Hu, N. Navet, "Model-Based Design Languages:A Case Study", short paper, 13th IEEE International Workshop on Factory Communication Systems (WFCS’2017), Trondheim, May 31-June 2, 2017. A comparison of the CPAL and Promela languages. N. Navet, L. Fejoz, "CPAL: High-Level Abstractions for Safe Embedded Systems", 16th Workshop on Domain-specific Modeling Workshop (DSM), Amsterdam, October 30, 2016. S. M. Sundharam, S. Altmeyer, L. Havet, N. Navet, "Model-Based Development Environment for Rapid-Prototyping of Latency-Sensitive Control Software", 6th International Symposium on Embedded Computing and System Design (ISED), Patna, India, December 15-17,2016. S. M. Sundharam, S. Altmeyer, L. Havet, N. Navet, "Connected Motorized Riders - A Smart Mobility System to Connect Two and Three-Wheelers", runner-up at the Grand Challenge: Smart Embedded Applications and IoT organized along with ISED 2016, Patna, India, December 15-17,2016. K. Salhi, M. Deaconu, A. Lejay, N. Champagnat, N. Navet, "Regime switching model for financial data: empirical risk analysis", Physica A, Elsevier Science, vol 461, pp148–157, November 2016. S. M. Sundharam, S. Altmeyer, N. Navet, "Model Interpretation for an AUTOSAR compliant Engine Control Function", 7th International Workshop on Analysis Tools and Methodologies for Embedded and Real-time Systems (WATERS), Toulouse, France, July 5, 2016. N. Navet, "The use of Simulation in the Design of Critical Embedded Systems", NAFEMS Conference, Paris, June 8-9, 2016. Pdf of the slides (color). S. M. Sundharam, S. Altmeyer, N. Navet, "An Optimizing Framework for Real-time Scheduling", WiP session at the 22nd IEEE Real-Time Embedded Technology & Applications Symposium (RTAS 2016), Vienna, Austria, April 11-14, 2016. S. Altmeyer, N. Navet, "Towards a declarative modeling and execution framework for real-time systems", ACM SIGBED Review, Special Issue on First Workshop on Declarative Programming for Real-Time and Cyber-Physical Systems (DPRTCPS 2015, San-Antonio, USA, December 1, 2015), vol 13, n°2, pp30-33, March 2016. Pdf of the workshop slides. N. Navet, "Timing Analysis of Automotive Architectures and Software", Invited talk at the 19th Design, Automation and Test in Europe Conference (DATE 2016), Dresden, Germany, March 14-18, 2016. Pdf of the slides (color). S. Altmeyer, S. M. Sundharam, N. Navet, "The Case for FIFO Real-Time Scheduling", Technical Report, February 2016. M. Boyer, H. Daigmorte, N. Navet, J. Migge, "Performance impact of the interactions between time -triggered and rate-constrained transmissions in TTEthernet", Embedded Real-Time Software and Systems (ERTS 2016), Toulouse, France, January 27-29, 2016. N. Navet, L. Fejoz, L. Havet, S. Altmeyer, “Lean Model-Driven Development through Model-Interpretation: the CPAL design ﬂow”, Embedded Real-Time Software and Systems (ERTS 2016), Toulouse, France, January 27-29, 2016. Pdf of the slides (color). L. Ciarletta, L. Fejoz, A. Guenard, N. Navet, "Development of a safe CPS component: the hybrid parachute, a remote termination add-on improving safety of UAS", Embedded Real-Time Software and Systems (ERTS 2016), Toulouse, France, January 27-29, 2016. N. Navet, J. Seyler, J. Migge, "Timing verification of real­time automotive Ethernet networks: what can we expect from simulation? ", Embedded Real-Time Software and Systems (ERTS 2016), Toulouse, France, January 27-29, 2016. Conference paper based on the presentation with the same title at the SAE World Congress 2015. L. Fejoz, N. Navet, "The CPAL Programming Language", 2015. S. Altmeyer, N. Navet, L. Fejoz, "Using CPAL to model and validate the timing behaviour of embedded systems", 6th International Workshop on Analysis Tools and Methodologies for Embedded and Real-time Systems (WATERS), Lund, Sweden, July 7, 2015. N. Navet, J. Seyler, J. Migge, "Timing verification of real-time automotive Ethernet networks: what can we expect from simulation? ", presentation at the SAE World Congress 2015, "Safety-Critical Systems" Session, Detroit, USA, April 21-23, 2015. Pdf of the slides (color) – pdf of the slides (black and white). J. Seyler, N. Navet, L. Fejoz, “Insights on the Configuration and Performances of SOME/IP Service Discovery“, in SAE International Journal of Passenger Cars- Electronic and Electrical Systems, 8(1), 124-129, 2015. Oral presentation at the SAE World Congress, Detroit, USA, April 21-23, 2015. Pdf of the slides (color) – pdf of the slides (black and white). G. Brau, J. Hugues, N. Navet, Nicolas, "A Contract-Based approach to support Goal-Driven Analysis", IEEE 18th International Symposium on Object/Component/Service-Oriented Real-Time Distributed Computing (ISORC), Auckland, New Zealand, 2015. J. Seyler, T. Streichert, M. Glaß, N. Navet, J. Teich, "Formal Analysis of the Startup Delay of SOME/IP Service Discovery", Design, Automation and Test in Europe (DATE2015), Grenoble, France, March 13-15, 2015. N. Navet, S. Louvart, J. Villanueva, S. Campoy-Martinez, J. Migge, “Timing verification of automotive communication architectures using quantile estimation“, Embedded Real-Time Software and Systems (ERTS 2014), Toulouse, France, February 5-7, 2014. Pdf of the slides (color) - pdf of the slides (b&w). M. Boyer, L. Santinelli, N. Navet, J. Migge, M. Fumey, “Integrating end-system frame scheduling for more accurate AFDX timing analysis“, Embedded Real-Time Software and Systems (ERTS 2014), Toulouse, France, February 5-7, 2014. N. Navet, "Verification of automotive networks - what to expect (and not expect) from each technique", Automotive Bus systems + Ethernet, Stuttgart, Germany, December 9-11, 2013. Pdf of the slides (color) - pdf of the slides (b&w). N. Navet, "Quantile-based performance evaluation on CAN", 14th International CAN Conference, Paris, November 12-13, 2013. Pdf of the slides (color) - pdf of the slides (b&w). G. Brau, J. Hugues, N. Navet, "Refinement of AADL models using early-stage analysis methods: an avionics example". Available as technical report, October 2013. This is an extended version of the short paper published at the 4th Analytic Virtual Integration of Cyber-Physical Systems (AVICPS) Workshop, Vancouver, Canada, December 3, 2013. Co-located with RTSS 2013. N. Navet, F. Simonot-Lion, "In-vehicle communication networks - a historical perspective and review", Chapter of the Industrial Communication Technology Handbook (CRC Press/Taylor and Francis), Second Edition (published in August 2014). Preliminary version available as technical report, August 2013. This is a major update of the review paper on automotive networks published in IEEE Proceedings in 2005. N. Champagnat, M. Deaconu, A. Lejay, N. Navet, S. Boukherouaa, "An empirical analysis of heavy-tails behavior of financial data: the case for power laws", available as technical report, 2013. M. Boyer, N. Navet, M. Fumey, J Migge, L. Havet, "Combining static priority and weighted round-robin like packet scheduling in AFDX for incremental certification and mixed criticality support", 5th European Conference for Aeronautics and Space Sciences (EUCASS), Munich, Germany, July 1-5, 2013. B. Bavoux, A. Monot, N. Navet, "Dispositif de résolution d'encombrement au sein d'un reseau de communication, par recalage temporel global des instants de production de bits de message des organes communicants", December 2012. Patent FR2976432 filed by INRIA and PSA Peugeot Citroën on June 6, 2011. B. Bavoux, A. Monot, N. Navet, "Dispositif de détection d'encombrement d'un réseau de communication, par analyse de temps d'attente de messages periodiques devant être transmis par un organe communicant", December 2012. Patent FR2976434 filed by INRIA and PSA Peugeot Citroën on June 6, 2011. B. Bavoux, A. Monot, N. Navet, "Dispositif de résolution d'encombrement au sein d'un réseau de communication, par introduction d'un décalage temporel lors de la transmission d'un message, puis lors de la production des messages suivants à transmettre", December 2012. Patent FR2976435 filed by INRIA and PSA Peugeot Citroën on June 6, 2011. R. Davis, N. Navet, "Traffic Shaping to Reduce Jitter in Controller Area Network (CAN)", ACM SIGBED Review, Special issue of the 24th Euromicro Conference on Real-Time Systems (ECRTS12), Volume 9, Issue 4, pp37-40, November 2012. N. Navet, "Industrial practices of real-time scheduling", lecture at the colloquium "1972-2012: 40 years of research in real-time scheduling", scientific days of the University of Nantes, June 8, 2012. Nantes, France. R. Davis, N. Navet, "Controller Area Network (CAN) Schedulability Analysis for Messages with Arbitrary Deadlines in FIFO and Work-Conserving Queue", 9th IEEE International Workshop on Factory Communication System (WFCS 2012), Lemgo/Detmold, Germany, May 21-24, 2012. P. Meumeu-Yomsi, D. Bertrand, N. Navet, R. Davis, "Controller Area Network (CAN): Response Time Analysis with Offsets", 9th IEEE International Workshop on Factory Communication System (WFCS 2012), Lemgo/Detmold, Germany, May 21-24, 2012. Pdf of the slides. A. Monot, N. Navet, B. Bavoux, F. Simonot-Lion, "Multi-source software on multicore automotive ECUs - Combining runnable sequencing with task scheduling", IEEE Transactions on Industrial Electronics, vol 59, n°10, pp 3934 - 3942, 2012. N. Navet, H. Perrault, "CAN in Automotive Applications: a look forward", 13th International CAN Conference, Hambach, Germany, March 5-6, 2012. Pdf of the slides (color) - pdf of the slides (b&w). An abridged version of this paper also appeared in the June 2012 issue of the CAN Newsletter (pp 46-49). A. Monot, N. Navet, B. Bavoux, "Fine-grained Simulation in the Design of Automotive Communication Systems", Embedded Real-Time Software and Systems (ERTS2 2012), Toulouse, France, February 1-3, 2012. M. Boyer, N. Navet and M. Fumey, "Experimental assessment of timing verification techniques for AFDX", Embedded Real-Time Software and Systems (ERTS2 2012), Toulouse, France, February 1-3, 2012. M. Boyer, N. Navet, J. Migge, "A simple and efficient class of functions to model arrival curve of packetised flows", First International Workshop on Worst-case Traversal Time (WCTT), in conjunction with the 32nd IEEE Real-time Systems Symposium (RTSS), Vienna, Austria, November 29, 2011. Pdf of the slides. N. Navet, "Critical embedded systems : trends in the design methods", Industrial Trend Forecasting Day of the GDR ASR, Paris, November 3, 2011. Pdf of the slides (color) - pdf of the slides (b&w). D. Khan, R. Davis, N. Navet, "Schedulability analysis of CAN with non-abortable transmission Requests", 16th IEEE International Conference on Emerging Technologies and Factory Automation (ETFA 2011), Toulouse, France, September 2011. N. Navet, A. Monot, B. Bavoux, "Impact of clock drifts on CAN frame response time distributions", 16th IEEE International Conference on Emerging Technologies and Factory Automation (ETFA 2011), Industry Practice track, Toulouse, September 2011. N. Navet,"Automotive communication systems: from dependability to security", talk at the 1st Seminar on Vehicular Communications and Applications (VCA 2011), Luxembourg, May 2011. Pdf of the slides (color) - pdf of the slides (b&w). M. Boyer, N. Navet, X. Olive, E. Thierry, "The PEGASE project: precise and scalable temporal analysis for aerospace communication systems with Network Calculus", 4th International Symposium on Leveraging Applications of Formal Methods & Verification and Validation (ISOLA 2010), Amirandes, Heraclion, Crete, 18-20 October 2010. N. Navet, A. Monot, B. Bavoux, F. Simonot-Lion, "Multi-source and multicore automotive ECUs - OS protection mechanisms and scheduling", invited paper at the IEEE International Symposium on Industrial Electronics (ISI 2010), Bari, Italy, July 4-7, 2010. N. Navet, A. Monot, J. Migge, "Frame latency evaluation: when simulation and analysis alone are not enough", 8th IEEE International Workshop on Factory Communication Systems (WFCS2010), invited paper at the Industry Day, May 19, 2010. A. Monot, N. Navet, B. Bavoux, F. Simonot-Lion, "Multicore scheduling in automotive ECUs", Embedded Real-Time Software and Systems (ERTS 2010), Toulouse, France, May 19-21, 2010. This paper is in the same line as the one at IEEE ISIE except that it focuses on scheduling (it does not address protection mechanisms), and presents more experiments but no theoretical results. Pdf of the slides (color) - pdf of the slides (black and white). D. Khan, R. Bril, N. Navet, "Integrating Hardware Limitations in CAN Schedulability Analysis", WiP at the 8th IEEE International Workshop on Factory Communication Systems (WFCS 2010), Nancy, France, May 2010. N. Navet, B. Delord, M. Baumeister, "Virtualization in Automotive Embedded Systems : an Outlook", talk at RTS Embedded System 2010, Paris, France, March, 2010. Pdf of the slides (color) - pdf of the slides (b&w). D. Khan, N. Navet, B. Bavoux, J. Migge, "Aperiodic Traffic in Response Time Analyses with Adjustable Safety Level", 14th IEEE International Conference on Emerging Technologies and Factory Automation (ETFA 2009), Mallorca, Spain, September 2009. Pdf of the slides (color) - pdf of the slides (black and white). N. Navet, "In-Vehicle Networking : a Survey and Look Forward", Workshop on Specialized Networks, in conjunction with ETFA 2009, Mallorca, Spain, September 26, 2009. Pdf of the slides (color) - pdf of the slides (b&w). N. Navet, "Automotive embedded systems: some research challenges", Summer School on Real-Time Systems (ETR-09), Paris, September 3, 2009. Pdf of the slides (color) - pdf of the slides (b&w). N. Navet with J. Migge, A. Harrar, V. Sollier and M. Merey Marzat. "Procédé de gestion des trames de données dans un bus de communication de type bus CAN", April 2009. Patent FR2922038 filed by PSA Peugeot Citroën on October 5, 2007. N. Navet, H. Perrault, "Mécanismes de protection dans AUTOSAR OS", RTS Embedded Systems 2009 (RTS'09), Paris, March 31 - April 2, 2009. Pdf of the slides (color) - pdf of the slides (black and white). N. Navet, F. Simonot-Lion, editors, "The Automotive Embedded Systems Handbook", Industrial Information Technology series, CRC Press / Taylor and Francis, ISBN 978-0849380266, December 2008. S. Merz, N. Navet, editors, "Modeling and Verification of Real-Time Systems - Formalisms and Software Tools", ISTE publishing / John Wyley and Sons, 448 pages, ISBN 9781847040244, January 2008. The preface can be downloaded here as well as the TOC and a sample chapter. M. Grenier, N. Navet, "Fine Tuning MAC Level Protocols for Optimized Real-Time QoS", IEEE Transactions on Industrial Informatics, special issue on Industrial Communication Systems, vol 4, nº1, 2008. An earlier version is available as INRIA research report RR-6247. B. Gaujal, N. Navet, "Dynamic Voltage Scaling under EDF Revisited", Real-Time Systems, Springer Verlag, vol. 37, nº1, pp77-97, 2007. Some results are available as research report INRIA RR-5125. V. Nélis, J. Goossens, N. Navet, R. Devillers, D. Milojevic, "Power-Aware Real-Time Scheduling on Identical Multiprocessor Platforms", Proc. of IEEE International Conference on Sensors Networks, Ubiquitous and Thrustworthy Computing, Taichung, Taiwan, June 11-13, 2008. N. Navet, "Automating the Configuration of the FlexRay Communication Cycle", FlexRay Product Days, Fellbach, Germany, November 2008. Pdf of the slides (color) - pdf of the slides (black and white). N. Navet, F. Simonot-Lion, "A Review of Embedded Automotive Protocols", chapter 4 in the Automotive Embedded Systems Handbook, 2008. M. Grenier, L. Havet, N. Navet, "Scheduling Frames with Offsets in Automotive Systems: a Major Performance Boost", chapter 14 in the Automotive Embedded Systems Handbook, 2008. (reworked version of our ERTS 2008 paper on offsets). M. Grenier, L. Havet, N. Navet, "Pushing the limits of CAN - Scheduling frames with offsets provides a major performance boost", Proc. of the 4th European Congress Embedded Real Time Software (ERTS 2008), Toulouse, France, January 29 - February 1, 2008. Pdf of the slides - pps of the slides. N. Navet, M. Grenier, L. Havet, "Configuring the communication on FlexRay: the case of the static segment", Proc. of the 4th European Congress Embedded Real Time Software (ERTS 2008), Toulouse, France, January 29 - February 1, 2008. Pdf of the slides - pps of the slides. N. Navet, S.-H. Chen, "On Predictability and Profitability: Would GP Induced Trading Rules be Sensitive to the Observed Entropy of Time Series? ", in A. Babrazon, M. O'Neill (eds. ), Natural Computing in Computational Economics and Finance, Studies in Computational Intelligence Series, Springer, February 2008. Slides of the talk on this work given at the "2nd Workshop: Bridging Mathematics, Natural Sciences, Social Sciences, and Finance", International University of Monaco, April 9-11, 2008. Pdf of the slides - pps of the slides - abstract in pdf. N. Navet, L. Cucu, R. Schott, "Probabilistic estimation of response times through large deviations", Proc. WiP of the 28th IEEE Real-Time Systems Symposium (RTSS 2007), Tucson, Arizona, USA, December 3-6, 2007. C. Braun, L. Havet, N. Navet, "NETCARBENCH: a benchmark for techniques and tools used in the design of automotive communication systems", Proc of the 7th IFAC International Conference on Fieldbuses & Networks in Industrial & Embedded Systems (FeT 2007), Toulouse, France, November 7-9, 2007. Executables, GPL source code and manual available here. M. Grenier, N. Navet, "Scheduling Configuration on Posix 1003.1b Systems", available as research report INRIA RR-6209, 2007. I. Puaut, N. Navet, F. Simonot-Lion, editors, Proceedings of the 15th International Conference on Real-Time and Network Systems (RTNS 2007), 238 pages, ISBN 2-905267-53-4, March 2007. The full proceedings are available on-line here in pdf format. M. Grenier, N. Navet, "Improvements in the configuration and analysis of Posix 1003.1b scheduling", Proc. of the 15th International Conference on Network and Systems (RTNS'2007), Nancy, France, March 29-30, 2007. N. Navet, S.-H. Chen, "Financial Data Mining with Genetic Programming: A Survey and Look Forward", invited paper at the 56th session of the International Statistical Institute (ISI 2007), August 22 to 29, Lisboa Portugal, 2007. Pdf of the slides - pps of the slides (15MB). N. Navet, R. Schott, "Assessing the risk and return of financial trading systems - a large deviation approach", 6th International Conference on Computational Intelligence in Economics & Finance (CIEF2007), Salt-Lake City, USA, July 18-24, 2007. Pdf of the slides - pps of the slides. N. Navet, S.-H. Chen, "Entropy rate and profitability of technical analysis: experiments on the NYSE US 100 stocks", 6th International Conference on Computational Intelligence in Economics & Finance (CIEF2007), Salt-Lake City, USA, July 18-24, 2007. Pdf of the slides - pps of the slides. F. Simonot-Lion, N. Navet, "Les réseaux temps réel embarqués dans les véhicules", chapter 10, Traité I2C Systèmes Temps Réel volume 2, Hermès Science, ISBN2-7462-1304-4, June 2006. N. Navet, B. Gaujal, "Ordonnancement temps réel et minimisation de la consommation d'énergie", chapter 4, Traité I2C Systèmes Temps Réel volume 2, Hermès Science, ISBN2-7462-1304-4, June 2006. V. Rao, N. Navet, G. Singhal, A. Kumar, G.S. Visweswaran, "Battery Aware Dynamic Scheduling for Periodic Task Graphs", Proc. of the 14th International Workshop on Parallel and Distributed Real-Time Systems (WPDRTS 2006), Island of Rhodes, Greece, April 25-26, 2006. Here are the slides of the talk. R. Saket, N. Navet, "Frame Packing Algorithms for Automotive Applications", preliminary version available as research report INRIA RR-4998, Journal of Embedded Computing, vol. 2, nº 1, pp93-102, 2006. S.-H. Chen, N. Navet, "Pretests for genetic-programming evolved trading programs: zero-intelligence strategies and lottery trading" (better download this extended version that has appeared as book chapter). Proc. of the 13th International Conference on Neural Information Processing (ICONIP2006), LNCS volume 4234/2006, Hong-Kong, October 3-6, 2006. N. Navet, "Contributions to the Engineering of Safety Critical Automotive Systems", National Taiwan University, Department of Computer Science and Information Engineering, 16th June 2006, slides in pdf format. R. Santos Marques, F. Simonot-Lion, N. Navet, "Development of an in-vehicle communication middleware", Object Oriented Modeling of Embedded Real-Time Systems, Post-proceedings of OMER 3, Heinz-Nixdorf Institute publisher, ISBN3-939350-10-9, 2006. R. Santos Marques, F. Simonot-Lion, N. Navet, "Optimal configuration of an in-vehicle embedded middleware", Third Taiwanese-French Conference on Information Technology, Nancy, France, March 28-30, 2006. 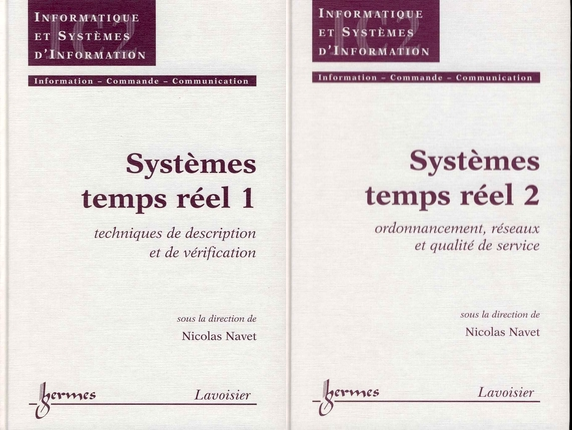 N. Navet, editor, book in French in 2 volumes on Real-Time Systems. Systèmes temps réel 1 : Techniques de description et de vérification (preface, table of contents), ISBN 2-7462-1303-6, 352 pages - Systèmes temps réel 2 : Ordonnancement, réseaux et qualité de service (preface, table of contents), ISBN2-7462-1304-4, 336 pages, IC2 series, Hermès Science Publishing, June 2006. N. Navet, editor, Special Issue "Best papers of RTS'2005", Journal of Embedded Computing, Volume 2, Number 3-4, 2006. The editorial and table of contents are available here in pdf. F. Jumel, N. Navet, F. Simonot-Lion, "Evaluation de la Qualité de Fonctionnement d'une Application de Contrôle-Commande en fonction de Caractéristiques de son implantation", Technique et Science Informatiques, vol 5, nº3, pp371-398, 2006. M. Grenier, J. Goossens, N. Navet, "Near-Optimal Fixed Priority Preemptive Scheduling of Offset Free Systems", Proc. of the 14th International Conference on Network and Systems (RTNS'2006), Poitiers, France, May 30-31, 2006. N. Navet, J. Goossens, editors, Special Issue of Technique et Science Informatiques (TSI) entitled "Ordonnancement pour les systèmes temps réel", 134 pages, Issue 8/2005, ISBN 2-7462-1325-7, January 2006. B. Gaujal, N. Navet, "Maximizing the Robustness of TDMA Networks with Applications to TTP/C", Real-Time Systems, Kluwer Academic Publishers, vol 31, nº1-3, pp5-31, December 2005. Here are some slides of talks given on this study (slides in french pdf format - slides in english pdf format). Preliminary version available as research report INRIA RR-4614. B. Gaujal, N. Navet, C. Walsh, "Shortest Path Algorithms for Real-Time Scheduling of FIFO tasks with Optimal Energy Use", ACM Transactions on Embedded Computing Systems, vol 4, nº4, pp907 - 933, November 2005. Some results have been published as research report INRIA RR-4886. G. Singhal, V. Rao, A. Kumar, N. Navet, "Battery Model for Embedded Systems", Proc. of the 18th International Conference on VLSI Design (VLSI'2005), Calcuta (India), 3-7 January 2005. Here are the slides of the talk. R. Santos Marques, N. Navet, F. Simonot-Lion, "Configuration of In-Vehicle Embedded Systems under Real-Time Constraints", Proc. 10th IEEE International Conference on Emerging Technologies and Factory Automation (ETFA 2005), Catania, Italy, 19-22 September 2005. N. Navet, F. Simonot-Lion, "Fault Tolerant Services for Safe In-Car Embedded Systems", in The Embedded Systems Handbook, CRC Press, ISBN 0-8493-2824-1, August 2005. N. Navet, Y.-Q. Song, F. Simonot-Lion, C. Wilwert, "Trends in Automotive Communication Systems", Proceedings of the IEEE, special issue on Industrial Communications Systems, invited paper, vol 96, nº6, pp1204-1223, June 2005. (An updated version appeared as chapter 4 in The Automotive Embedded Systems Handbook in 2008). B. Gaujal, N. Navet, "Fault Confinement mechanisms on CAN : Analysis and Improvements", IEEE Transactions on Vehicular Technology, vol 54, nº3, pp1103-1113, May 2005. Preliminary version available as research report INRIA RR-4603 . N. Navet, "Scheduling under Posix1003.1b", seminar at the University Koblenz-Landau (Germany), 11th May 2005, slides in pdf format. C. Wilwert, N. Navet, Y.-Q. Song, F. Simonot-Lion, "Design of Automotive X-by-Wire Systems", in The Industrial Communication Technology Handbook, CRC Press, ISBN 0-8493-3077-7, January 2005. M. Grenier, N. Navet, "New Preemptive Scheduling Policies for Improving Real-Time Behavior", Proc. 10th IEEE International Conference on Emerging Technologies and Factory Automation (ETFA 2005), Catania, Italy, 19-22 September 2005. N. Navet, editor, Proceedings of the 4th Summer School on Real-Time Systems (ETR'05), Nancy (France), 296 pages, ISBN 2905267-47-X, September 2005. The full proceedings are available on-line here in pdf format (many papers are in english). N. Navet, editor, Proceedings of the 13th International Conference on Real-Time Systems (RTS'2005), Paris, April 6-7, 515 pages, 2005. N. Navet, M. Grenier, "Creating New Real-Time Scheduling Policies: Why and How? ", 2nd Taiwanese-French Conference in Information Technologies, Tainan, Taiwan, 23-25 March 2005. Invited talk. N. Navet, "Ordonnancement sous Posix 1003.1b", journée thèmes émergents du chapitre français de l'ACM-SIGOPS sur les systèmes temps réel embarqués, 18th November 2004, slides in pdf format. F. Jumel, N. Navet, F. Simonot-Lion, "Simulateur d'Architectures Opérationnelles de Contrôle-Commande", Proc. of the 12th International Conference on Real-Time Systems (RTS'04), Paris, 30-31 March 2004. R. Brito, N. Navet, "Low-Power Round-Robin Scheduling", Proc. of the 12th International Conference on Real-Time Systems (RTS'04), Paris, 30-31 March 2004. Optimizing the Robustness of X-by-Wire using Word Combinatorics", Ecole Polytechnique Fédérale de Lausanne (EPFL), Network Calculus Group Seminar, 3rd March 2004, slides in pdf format. N. Navet, "Ordonnancement sous contrainte d´énergie", action Conception Faible Consommation, 30th January 2004, slides in pdf format. N. Navet, "Le réseau FlexRay - Comparaison avec TTP/C", GDR "Spécification Temporelle et Stochastique et Systèmes Temps Réel'' (STRQDS), 16th January 2004, slides in pdf format. B. Gaujal, N. Navet, J. Migge, "Dual-Priority versus Background Scheduling : a Path-wise Comparison", Real-Time Systems, Springer Verlag, vol. 25, nº1, pp39-66, 2003. Some results have been published as research report INRIA RR-3734. N. Navet, J. Migge, "Fine Tuning the Scheduling of Tasks through a Genetic Algorithm: Application to Posix1003.1b Compliant OS", IEE Proceedings Software, IEE, vol. 150, nº1, pp13-24, 2003. Preliminary version available as research report INRIA RR-3730. F. Jumel, N. Navet, F. Simonot-Lion, "Nouvelles politiques pour la réservation explicite de ressources en avance", Technique et Science Informatiques, special issue on real-time systems, vol. 22, nº5, pp599-617, 2003. J. Migge, A Jean-Marie, N. Navet, "Timing Analysis of Compound Scheduling Policies : Application to Posix1003.1b", Journal of Scheduling, Springer Verlag, vol. 6, nº5, pp457-482, 2003. R. Santos Marques, N. Navet, F. Simonot-Lion, "Frame Packing under Real-Time Constraints",Proc. of the 5th FeT IFAC Conference (FeT'2003), Fieldbus Technology, Aveiro (Portugal), 7-8 July 2003 (same goals as the paper published in RTS'03 but improved heuristics). F. Jumel, N. Navet, F. Simonot-Lion, "Influence des performances d'une architecture informatique sur la fiabilité des systèmes échantillonnés", Proc. of the 11th International Conference on Real-Time Systems (RTS'03), Paris, 2-3 April 2003. R. Santos Marques, N. Navet, F. Simonot-Lion, "Construction de trames sous contraintes temps réel", Proc. of the 11th International Conference on Real-Time Systems (RTS'03), Paris, 2-3 April 2003. B. Gaujal, N. Navet, "Ordonnancement sous contraintes de temps et d'énergie", Ecole d'été Temps Réel 2003, ISBN 2-9520326-0-2, Toulouse, September 2003. (a more recent and comprehensive talk on the same topic). B. Gaujal, N. Navet, C. Walsh, "Real-Time Scheduling for Optimal Energy Use", Faible Tension Faible Consommation (FTFC'03), Paris, May 2003. N. Navet, J.-P. Thomesse, "L'ordonnancement, la clé d'une gestion efficace des ressources", J'Automatise, Nº24, September/October 2002. N. Navet, Y.-Q. Song, "Validation of Real-Time In-Vehicle Applications", Computers in Industry, Elsevier Science, vol. 46, nº 2, pp107-122, 2001. B. Gaujal, N. Navet, "Fault Confinement mechanisms on CAN : Analysis and Improvements", Proc. of the 4th FeT IFAC Conference on Fieldbus Technology (FeT'01), Nancy (France), 15-16 Novembre 2001. (slides of the presentation). Extended version published as journal paper with the same title. N. Navet, Y-Q. Song, F. Simonot, "Worst-Case Deadline Failure Probability in Real-Time Applications Distributed over CAN (Controller Area Network)", Journal of Systems Architecture, Elsevier Science, vol. 46, nº7, 2000. N. Navet, Y-Q. Song, "Reliability Improvement of the Dual-Priority Protocol under Unreliable Transmission", Control Engineering Practice, Pergamon Press, vol. 7, nº8, 1999. N. Navet, "Evaluation de Performances Temporelles et Optimisation de l'Ordonnancement de Tâches et de Messages", Phd Thesis, INPL/LORIA,11/1999 (abstract in English - abstract in French). Y.-Q. Song, F. Simonot-Lion, N. Navet, "De l'évaluation de performances du système de communication Ã la validation de l'architecture opérationnelle", Ecole d'été Temps Réel 1999, ISBN 2-9514541-1-2, Poitiers, September 1999. N. Navet, Y.-Q. Song, "Une Politique à Changement de priorité pour l'ordonnancement de messages dans des environnements bruités", Proc. of the 7ème Colloque Francophone sur l'Ingéniérie des Protocoles (CFIP'99), Nancy (France), 26-29 April 1999. N. Navet, "Controller Area Network : CANs use within automobiles", IEEE Potentials, vol. 17, nº4, October/November 1998. N. Navet, Y-Q. Song, "Design of Reliable Real Time Applications Distributed over CAN (Controller Area Network)", Proc. of the 9th IFAC Symposium on Information Control in Manufacturing (INCOM'98), Metz (France), 22-24 June, 1998. N. Navet, Y.-Q. Song, "On fault tolerance, worst-case message response time analysis and hard real-time guarantees in CAN", Proc. of the 23nd IFAC/IFIP Workshop on Real-Time Programming (WRTP'98), Shantou (China), 23-25 June 1998. N. Navet, Y-Q. Song, J.-P. Thomesse, "Le réseau CAN et les erreurs de transmission", CIMAX Terrain, April 1998. N. Navet, Y.-Q. Song, F. Simonot, "Evaluation de Performances et Tolérances aux fautes d'Applications Temps Réel Distribuées autour du réseau CAN", Proc. of the 6th International Conference on Real-Time Systems (RTS'98), pp197-216, Paris, 14-16 January 1998. N. Navet, Y-Q. Song, "CAN Modeling : towards integrating analytic methods and simulation", Proc. of the OPnet European Users Group (OPEUG'97), Paris, 23 October 1997. N. Navet, P. Bélissent, Y-Q. Song, "VACANS: un Outil d'Aide à la Validation d'Applications Réparties autour du Réseau CAN", Proc. of the 6ème Atelier d'Evaluation de Performances, Versailles (France), 25-28 November 1996. Y.-Q. Song, F. Simonot-Lion, N. Navet, "Validation of Distributed Real-Time Systems thanks to Performance Evaluation of their Physical Architecture", Proc. of the IEEE Symposium on Discrete Events and Manufacturing Systems (CESA'96), pp507-512, Lille (France), 9-12 July 1996. N. Navet, "Le Réseau CAN et sa Modélisation sous forme de Réseaux de Files d'Attente", Proc. AGI'96, Automatique-Génie Informatique-Image, Tours (France), 6-7 June 1996. N. Navet, J. Lecuivre, Y-Q. Song, "A Simulation Framework for Performance Evaluation of Communication Profiles : Application to the MMS/TCP/Ethernet Profile", Proc. of the 7th European Symposium on Simulation (ESS'95), Erlangen (Germany), 26-28 October 1995.